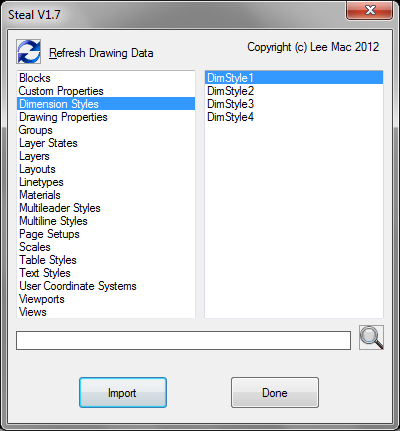 The program allows the user to import (humourously: 'steal') items from another drawing into the current drawing. Upon running the program with the command syntax 'Steal' at the AutoCAD® command-line, the user is prompted to select a drawing file (dwg/dwt/dws) from which to steal items. Following a valid selection, if the selected drawing contains items not already present in the current drawing, a dialog will appear displaying items available for import. Steal from Drawing is brought to you by Lee Mac Programming. It's free.